The film Getting Home from Chinese director Zhang Yang opens the Global Lens Series of films from around the world at Bates College with 8 p.m. showings on Friday, Sept. 11, and Sunday, Sept. 13, in Room 105 of the Olin Arts Center, 75 Russell St.
Getting Home tells the story of Zhao, a construction worker who has promised to bury a dying coworker in the Three Gorges region, hundreds of miles away. The comedy follows him on this journey, detailing his adventures and encounters with the colorful inhabitants of the Chinese countryside. Made in 2007, Getting Home is in Mandarin with English subtitles. 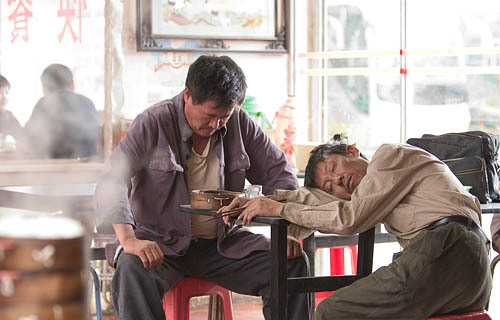 Getting Home is the fifth feature film from Zhang Yang, a director who began making movies after finding success as a director of plays and underground music videos. Yang’s films have won numerous awards, both in his native China and abroad at venues like the Toronto Film Festival, where his film Shower was awarded the FIPRESCI prize from the International Federation of Film Critics to mark enterprising filmmaking. Learn more about Getting Home and the entire Global Film Series.